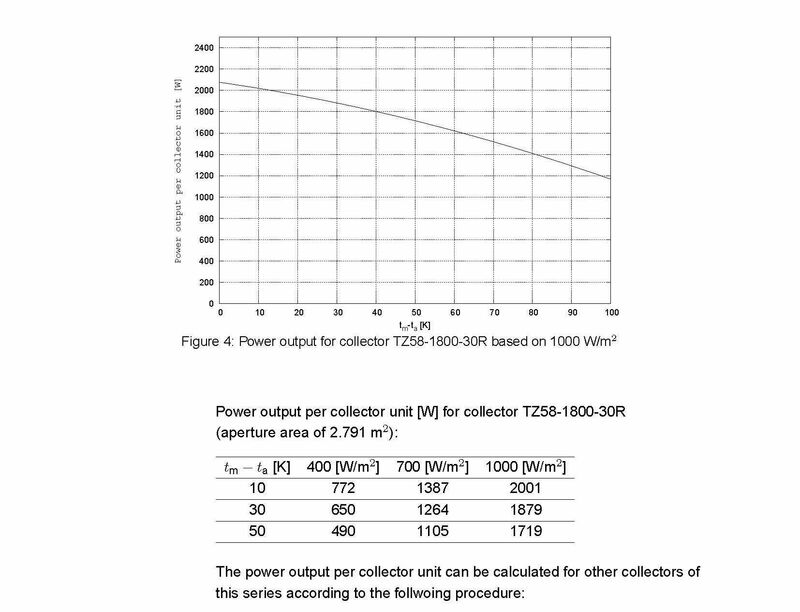 The previous graph shows the Sunrain TX58 1800 30R collectors’ solar vacuum tube efficiency curve as per the Keymark Solar Certification. The variables are the incident sun’s radiated power in Watts/m2 and temperature differential between the fluid media and the surrounding air temperature. The greater this temperature difference the greater the heat loss is back to the environment. The peak performance of the solar collector is 2.1 Kw and this will only happen for a short while at start up, since as the temperature increases the power decreases. However, this number is good to know as it is the max output that a solar collector will produce. In certain conditions, when the suns power is greater than 1000 Watt/m2 we may see more, but this is short term. When sizing a solar system this is the maximum power we need to deal with.